Tip: Don’t be scared to treat yourself to a second slice after your hard work – it’s Christmas after all!!! Welcome back for our final part of the Christmas Recipe Series. You’ve devoured a gorgeous Duck Rillettes starter, tucked into the Ultimate Christmas Turkey and now it’s time for a delicious dessert before you put the feet up to watch your favourite Christmas movie! Our chefs have been trying out plenty of amazing dessert ideas in our Innovation Centre this month and we’ve all been doing way too much sampling!! 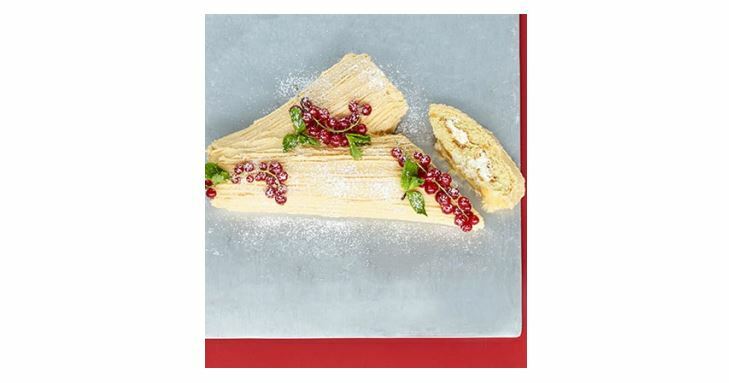 It was a difficult decision but we’ve decided to go with the Salted Caramel Buche de Noel for you to try at home. For the salted caramel paste, combine all the ingredients in a saucepan set over a low heat, and stir until the sugar has dissolved. Turn the heat up and bubble the sauce for 2-3 mins until thick & golden. Heat oven to 200C/180C fan/gas 6. Line a 24 x 32cm Swiss roll tin with baking parchment so it hangs over the edges, then butter well. Whisk the eggs and sugar together with an electric whiskfor 3-4 mins or until pale and thick. Fold the flour, baking powder and vanilla seeds into the egg mixture with a large metal spoon until there are no pockets of flour visible. Gently spread into your tin and bake in the oven for 12-15 mins or until lightly golden and springy to the touch. Remove from the oven, allow to cool for 1-2 mins or until cool enough to handle, then carefully roll up the sponge lengthways while it’s still warm (keeping the baking parchment attached). Leave to cool completely in its rolled-up shape. To make the icing, beat the butter and icing sugar until smooth, then mix in the caramel spread. Set aside. Whip the cream to soft peaks. Carefully unroll the sponge, then turn it so one long edge is towards you. Dot lumps of the caramel spread and caramel icing over the sponge (don’t use too much – you need the rest to ice the cake), keeping the last centimetre at the end furthest from you clean, as the filling will spread as it rolls. Spread the cream over the top using a palette knife. Using the parchment, roll up the sponge. Cut one end a few centimetres in at an angle to make a branch. Put the roll on a plate or board and add the branch so it fits on snugly. Use the remaining icing to ice the cake, making bark lines in the icing using a fork. Dust with icing sugar and decorate with the redcurrants and mint to serve. Merry Christmas from everyone at The Culinary Food Group, we hope you have a fantastic time with your loved ones. We also hope you’ve enjoyed reading our new recipes each month. If there’s any meals you’d like us to create in 2018 please send us a short message – we’d be delighted to hear from you! Once again happy Christmas and see you in the New Year!! Why not try our Christmas Starter and Christmas Main Recipes….